Discuss the prevalence of obstructive sleep apnea and the dental team’s role in managing this condition. List risk factors and comorbidities associated with this disorder. Explain assessment tools and treatment options for managing this patient population. Obstructive sleep apnea is a medical condition receiving escalated attention due to its associated dangers that range from systemic diseases to fatigue-related accidents. Approximately 5.9 million U.S. adults are diagnosed with this condition, whereas an estimated 23.5 million cases remain undiagnosed.1 The latter may be attributed to minimal sleep disorder training across many health care fields.1,2 This public health issue calls for dental professionals to increase their familiarity with obstructive sleep apnea, and implement screening protocols and an interprofessional approach to patient care. Doing so can contribute to early sleep apnea diagnosis and treatment that result in improved health outcomes. Due to the frequency with which patients visit oral health care providers, dental teams are on the frontline of disease detection. Information obtained from the medical history, as well as the extraoral and intraoral examination, can reveal obstructive sleep apnea risk factors.7 Assessment can be used to establish a preliminary sleep apnea diagnosis, allowing referral to a medical specialist for definitive diagnosis. Obstructive sleep apnea increases the risk of morbidity and mortality,6,8 which underscores the need for interprofessional collaboration in diagnosing and managing this condition. Diagnosis and appropriate treatment can also improve coexisting health conditions. Irregular cardiac rhythms are commonly seen in this patient population; furthermore, it has been reported to be a factor in nocturnal sudden death.6 Neuropsychological dysfunction can also result. Difficulty concentrating, attention deficits, dexterity issues, memory impairment, decreased cognitive processes and reduced visuomotor skills6 can occur, which negatively impact quality of life. Affected individuals may complain of excessive daytime sleepiness.6 Patients may experience morning headaches,6 irritability20 and depression21 from restlessness and interrupted sleep. Cognitive deficits,6 difficulty focusing20 and xerostomia6 can occur. Experiencing symptoms does not confirm a diagnosis, however. Appropriate testing and medical assessment are required to establish a definitive diagnosis. Considering polysomnography is not a feasible option for every patient, clinicians can use various methods to identify patients at risk for obstructive sleep apnea. Easily adopted, these screening tools are simple, effective and provide rapid results. 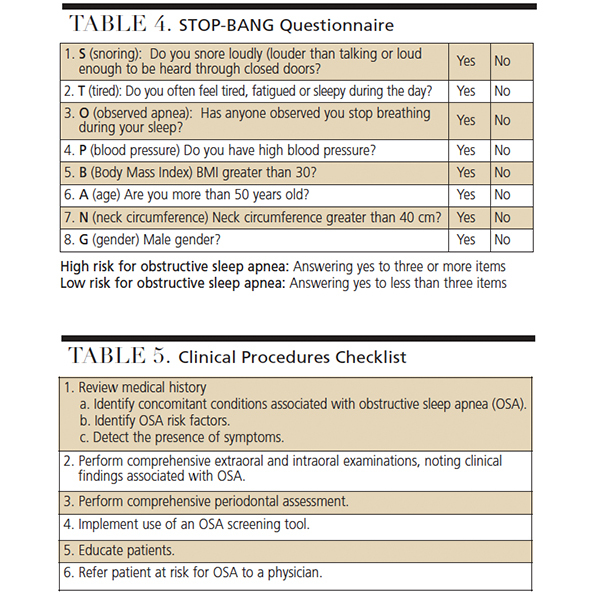 The Berlin questionnaire is composed of three sections assessing snoring, daytime fatigue and sleepiness, as well as medical history and anthropometric measurements.26 The STOP-BANG questionnaire (SBQ) consists of yes-or-no questions.26 The subjective items evaluate snoring, tiredness, observed apnea and blood pressure (hence the acronym STOP).26 The additional items correlate with BANG: body-mass index, age, neck circumference and gender.7 The STOP questionnaire is a more simplified screening instrument, comparable to the SBQ,7,26 and consists of four yes-or-no items correlating to the acronym. Obstructive sleep apnea cases vary from patient to patient. After diagnosis, numerous treatment options and lifestyle changes are recommended for patient management, and therapy should be individually tailored. Continuous positive airway pressure (CPAP) is the gold standard for treatment, especially in more severe cases. Use of a CPAP facemask improves quality of life, daytime sleepiness, cognitive function and blood pressure.9 One of the main issues with this treatment is a lack of patient compliance. Oral health professionals are leaders in oral disease detection and prevention. 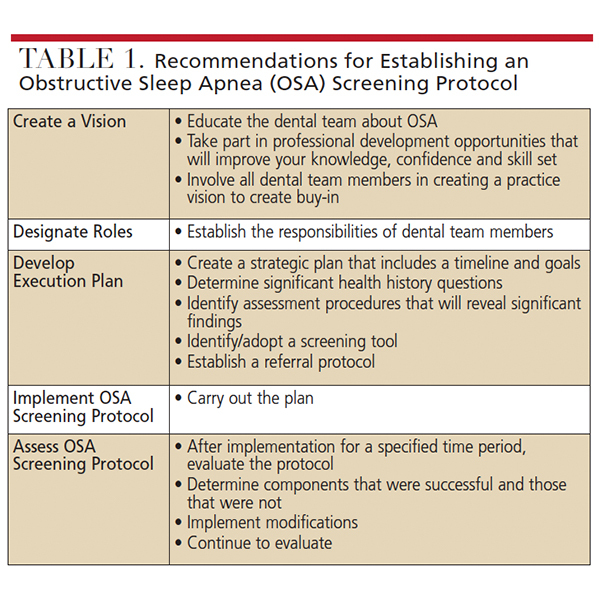 As such, dental teams are encouraged to adopt an appropriate obstructive sleep apnea screening protocol (Table 1). As noted at the outset, research suggests that approximately 80% of individuals with moderate-to-severe obstructive sleep apnea are undiagnosed.26 When a risk assessment is performed and patients are educated about the dangers of this condition, they will be more inclined to seek care. Performing a comprehensive assessment is key. Reviewing medical histories and asking questions related to risk factors, symptoms and concomitant conditions will help identify patients who may be affected by, or at risk for, obstructive sleep apnea. Performing thorough extraoral and intraoral examinations, and noting any clinical features associated with the disorder, are crucial steps. Clinical signs indicative of parafunctional habits and associated medical conditions should also be documented, as they may be linked to the disorder. Given the correlation between periodontal disease and obstructive sleep apnea, a comprehensive periodontal assessment is needed. Findings from the health history, clinical assessment and screening can help identify patients who should be referred to a physician for further evaluation. As noted, it is important to educate patients about the health risks, symptoms and treatment options associated with this condition.2,31 Education should also focus on lifestyle modifications, such as smoking cessation and nutritional counseling. Health care providers with diverse areas of expertise should collaborate to identify, educate and treat patients with obstructive sleep apnea.2 An interprofessional approach is required to address disease severity and patient disinclination to follow recommended treatment.2 Oral health professionals should be able to effectively communicate with medical providers about the patient’s risk factors and symptoms. By cultivating an increased understanding of this and other sleep disorders, dental teams can help mitigate issues associated with underdiagnosed and untreated cases. Referrals can lead to a definitive diagnosis, which can improve the management and prognosis of these patients. In light of the considerable number of undiagnosed cases, oral health professionals can play a significant role in detection and referral. The frequency of dental visits, assessment information obtained, and implementation of screening tools can identify individuals who either have, or are at risk for, obstructive sleep apnea. Educating patients about risk factors, concomitant issues, and treatment options is key to initiating appropriate medical care that will improve quality of life. Peppard PE, Young T, Barnet JH, Palta M, Hagen EW, Hla KM. Increased prevalence of sleep-disordered breathing in adults. Am J Epidemiol. 2013;177:1006–1014. Minichbauer BC, Sheats RD, Wilder RS, Phillips CL, Essick GK. Sleep medicine content in dental hygiene education. J Dent Educ. 2015;79:484–492. Kiraç D, Yassa ÖY, Gezmiş H, Domaç SF, Altunok EC, Genç E. The effect of different ApoE genotypes and other risk factors on obstructive sleep apnea syndrome formation. Turk J Neurol. 2017;23:199–204. National Institutes of Health U.S. National Library of Medicine. Obstructive sleep apnea. Available at: https://ghr.nlm.nih.gov/condition/obstructive-sleep-apnea#inheritance. Accessed October 15, 2018. Maurya R, Singh H, Mishra HA, Gupta A. Modified interim mandibular advancement (MIMA) appliance for symptomatic correction of obstructive sleep apnea. J Clin Diagn Res. 2016;10:ZH01–ZH03. Pataka A, Riha RL. The obstructive sleep apnoea/hypopnoea syndrome — An overview. Respir Med CME. 2009;2:111–117. 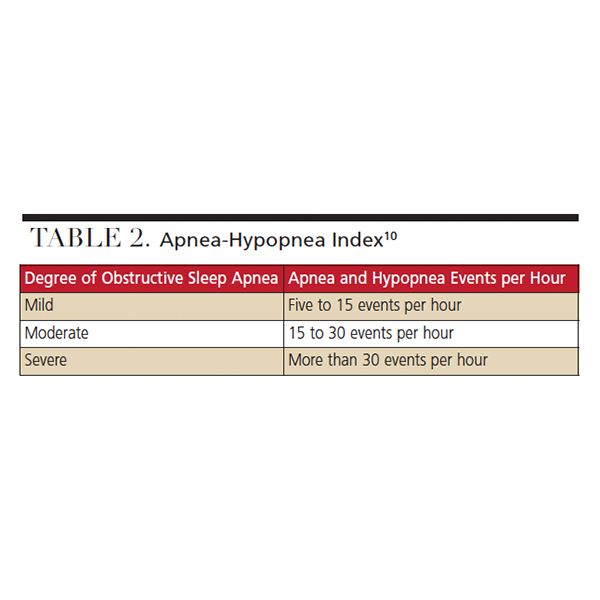 Soo-Lyun A, Ranson C. Obstructive sleep apnea for the dental hygienist: overview and parameters for interprofessional practice. Can J Dent Hyg. 2011;45:238–252. Gasparini G, Vicini C, De Benedetto M, et al. Diagnostic accuracy of obstructive airway adult test for diagnosis of obstructive sleep apnea. Available at: hindawi.com/journals/bmri/2015/915185/. Accessed October 15, 2018. 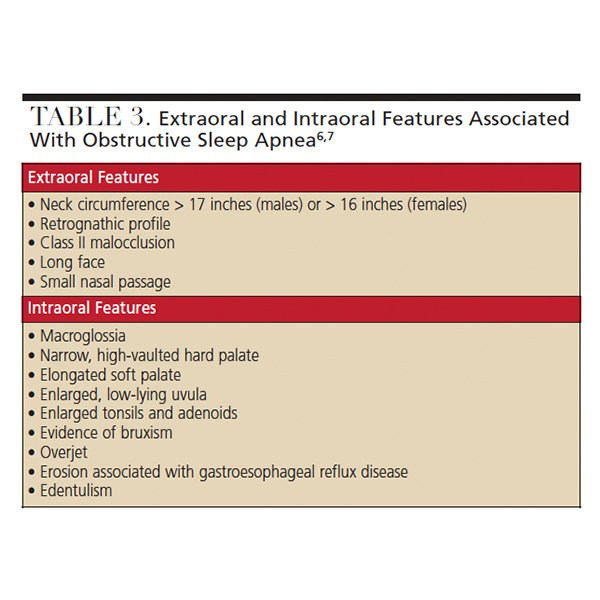 Gutierrez C, Brady P. Obstructive sleep apnea: a diagnostic and treatment guide. J Fam Pract. 2013;62:565–572. Epstein LJ, Kristo D, Strollo PJ Jr, et al. Clinical guideline for the evaluation, management and long-term care of obstructive sleep apnea in adults. J Clin Sleep Med. 2009;5:263–276. Pinto JA, Ribeiro DK, Cavallini AF, Duarte C, Freitas GS. Comorbidities associated with obstructive sleep apnea: a retrospective study. Int Arch Otorhinolaryngol. 2016;20:145–150. Famili P. Obstructive sleep apnea and periodontal disease: Review of established relationships and systematic review of the literature. J Dent Oral Health. 2015;1:1–4. Shaw JE, Punjabi NM, Wilding JP, Alberti KG, Zimmet PZ, International Diabetes Federation Taskforce on Epidemiology and Prevention. Sleep-disordered breathing and type 2 diabetes: a report from the International Diabetes Federation Taskforce on Epidemiology and Prevention. Diabetes Res Clin Pract. 2008;81:2–12. American Diabetes Association. Initial evaluation and diabetes management planning. Diabetes Care. 2015;38(Suppl 1):S17–S19. American Academy of Sleep Medicine. Patients with type 2 diabetes or hypertension must be evaluated for sleep apnea. Available at: https://aasm.org/patients-with-type-2-diabetes-or-hypertension-must-be-evaluated-for-sleep-apnea/. Accessed on October 15, 2018. Phillips CL, O’Driscoll DM. Hypertension and obstructive sleep apnea. Nat Sci Sleep. 2013;5:43–52. Sico JJ, Yaggi HK, Ofner S, et al. Development, validation, and assessment of an ischemic stroke or transient ischemic attack-specific prediction tool for obstructive sleep apnea. J Stroke Cerebrovasc Dis. 2017;26:1745–1754. Kapsimalis F, Kryger M. Obstructive sleep apnea in pregnancy. Sleep Med Clin. 2007;2:603–613. Qureshi A, Ballard RD. Obstrucive sleep apnea. J Allergy Clin Immunol. 2003;112:643–651. Mezick EJ, Hall M, Matthews KA. Are sleep and depression independent or overlapping risk factors for carido­meta­bolic disease? Sleep Med Rev. 2011;15:51–63. Kim SW, Kim BY, Han JJ, et al. Major factors affecting severity of obstructive sleep apnea. Indian J Otolaryngol Head Neck Surg. 2015;67(Suppl 1):S114–S118. Lim JS, Lee JW, Han C, Kwon JW. Correlation of soft palate length with velum obstruction and severity of obstructive sleep apnea syndrome. Auris Nasus Larynx. 2018;45:499–503. Winck M, Drummond M, Viana P, Pinho JC, Winck JC. Sleep bruxism associated with obstructive sleep apnoea syndrome—A pilot study using a new portable device. Rev Port Pneumol (2006). 2017;23:22–26. Okşayan R, Sökücü O, Uyar M, Topçuoğlu T. Effects of edentulism in obstructive sleep apnea syndrome. Niger J Clin Prac. 2015;18:502–505. Amra B, Rahmati B, Soltaninejad F, Feizi A. Screening questionnaires for obstructive sleep apnea: An updated systematic review. Oman Med J. 2018;33:184–192. Ibanez V, Silva J, Cauli O. A survey on sleep questionnaires and diaries. Sleep Med. 2018;42:90–96. Marti-Soler H, Hirotsu C, Marques-Vidal P, et al. The NoSAS score for screening of sleep-disordered breathing: a derivation and validation study. Lancet Respir Med. 2016;4:742–748. American Academy of Sleep Medicine. Sleep Education Sleep Apnea — Self-Tests. Available at: sleepeducation.org/essentials-in-sleep/sleep-apnea/self-tests. Accessed on October 15, 2018. Camacho M, Certal V, Abdullatif J, et al. Myofunctional therapy to treat obstructive sleep apnea: a systematic review and meta-analysis. Sleep. 2015;38:669–675. Kornegay EC, Brame JL. Obstructive sleep apnea and the role of dental hygienists. J Dent Hyg. 2015;89:286–292. From Decisions in Dentistry. November 2018;4(11):38–41. Cristina Casa-Levine, RDH, EdD, is an associate professor in the Department of Dental Hygiene at Farmingdale State College in East Farmingdale, New York. She also works clinically at a general practice office. Casa-Levine can be reached at cristina.casa@farmingdale.edu.